The Simtoka Dzong, built in 1629 by Zhabdrung Ngawang Namgyal, functions as a monastic and administrative centre and is the oldest dzong which has survived in its original form; Namgyal brought into vogue, for the first time in Bhutan, this concept of the "dzong" as castle monastery. An attack on the dzong was made by five disgruntled lamas in collaboration with an invading army of Tibetans who were against the Buddhist practices of the dzong under the control of Zhabdrung. They were defeated and Palden Lama who was the leader of the invaders died in the battle. Another attack on the dzong in 1630 by the Tibetans was successful for a while till part of the dzong caught fire and with the roof collapsing all the invading forces were killed. 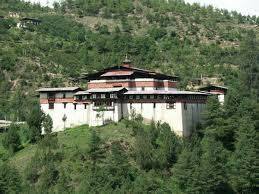 The first renovation and extension works on the dzong was completed in 1670 by Mingyur Tenpa, the third Druk Desi (regent). It has undergone many renovations in subsequent years also and the most recent refurbishing was carried out by architects from Japan. It is believed that the dzong provided protection against a demon which had disappeared into a rock close to the site and hence taken the name 'Simtoka' meaning "simmo" (demoness) and 'do' meaning "stone". The Buddhist school of Linguistics was established as part of the dzong by King Jigme Dorje Wangchuk at the suggestion of Queen Mayum Choying Wangmo Dorje, in 1961.